Before she can investigate the Flobble robbery, Ruby has something else to deal with: the adorable fluffy white puppy that Hailey has named Pixel. Hailey is not thrilled when she finds out that Ruby is determined to find the puppy’s true owner but grudgingly agrees to help. Then after disguising herself, just in case she runs into Detective Von Schlagen again, Ruby returns to the scene of the crime to continue her investigation of the Flobble robbery. On the way to FONK she bumps into Edmond who makes the classic mistake of offering to help Ruby with her investigation. While he distracts Colin Cumberbund, Ruby sneaks into Cumberbund’s office to search it. 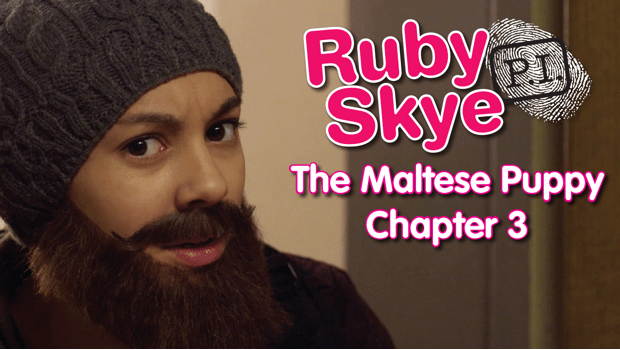 Like the first two seasons of Ruby Skye P.I., The Maltese Puppy stars Madison Cheeatow. The Maltese Puppy – Episode 3 (and all the other episodes of the season) was written by Julie Strassman and Jill Golick and directed by Kelly Harms.